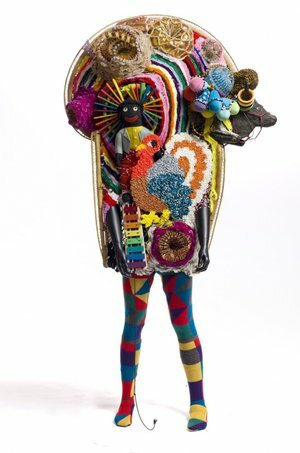 Artist Nick Cave (no, not the singer! ), has been creating his intriguing, wearable "Soundsuits" since 1992. The first rendition was made from sticks that Cave collected during the time of the LA riots, after Rodney King, a black taxi driver, was beaten by LA police. As a black American man, those events hit Cave at the core, and that first suit became a sort of conceptual layer of protection, a "second skin," or a suit of armor. 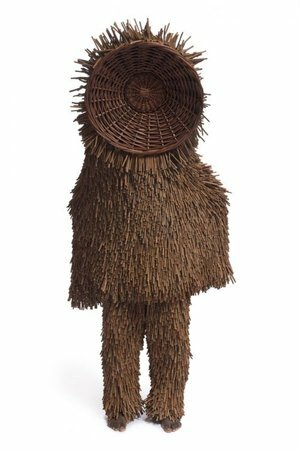 The idea of the "Soundsuit" came after he tried on the initial piece and noticed the sound the twigs made as he moved. 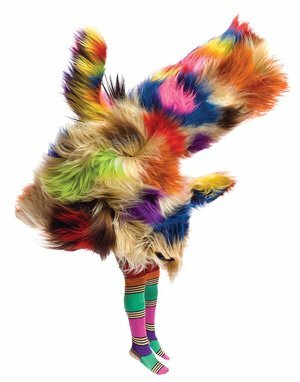 Thus began a series of Soundsuits in various materials—some colorful, shaggy and soft, others full of converging patterns and textures. While they are stunning when shown still, they become even more amazing in motion. When activated by the performer, they recall rituals and ceremonies, though not tied to a specific place or culture, but rather as a confluence of many influences and materials. Cave's Soundsuits led him towards sculptures and installations that like the Soundsuits, take familiar found elements to make uncharted and refreshingly unknown objects and environments.